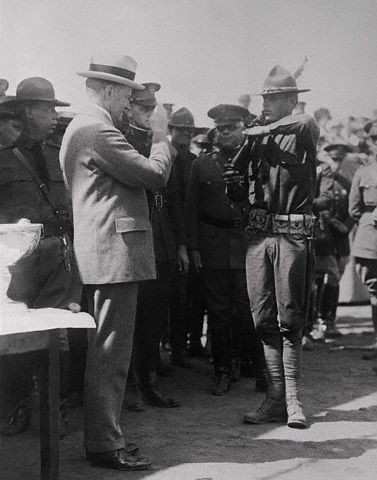 Photographed here is a father returning the salute of his son, Corporal John Coolidge, at the Civilian Military Training Corps out of Camp Devens, Massachusetts. When asked about his eldest, and only remaining, son’s academic future in one of his weekly press conferences, the President responded with a characteristic mixture of fatherly protectiveness and unyielding self-effacement, the latter quality he expected of both his boys. “I have already suggested to the press that I didn’t regard his actions as necessarily to be reported in the press, but of course if the press wants to report them there is nothing I can do about it. I don’t object to it especially, but I don’t think it is particularly a good thing for the boy. I don’t think it is a particularly good thing for the other boys in the country. There isn’t the slightest foundation for the report that appeared the other day that he is going to West Point. PRESIDENT: No, No. There was a report that made a categorical statement that he was going to West Point. That was followed in the course of two or three days by another that he was going to the Naval Academy. Either one of those could have been verified by simple inquiry at the office, if there was a desire to find out the truth. There was no foundation that I know of for either suggestion. He is going to Amherst College. I don’t think that that is a matter of enough public importance to justify any newspaper notice. He is doing the same as some hundreds of thousands of other young men that are going to take up their studies again when school opens” (The Talkative President, p.43). Coolidge seems to have regretted his decision early in life not to have enlisted in the service during the brief war with Spain (letter to Colonel Coolidge on September 9, 1898, cited in Your Son, Calvin Coolidge, p.94). He would not allow his sons to rest on family name or privilege, however. Freedom, like responsibility, carries a price, Coolidge knew, and John would have the benefit he never had, receiving a basic military training, strengthening the young man’s sense of prepared citizenship. Still, it was not easy being John. To paraphrase President Coolidge, it costs a great deal to be a President’s family.